Obviously, sign up for ObamaCare. Or try. Yes, yes, she's been trying to do that everyday this week. It's a few hours a day on hold on the phone. But she's so excited to be part of his great social experiment that she does it first thing each morning and hangs on for hours until something goes wrong and she gets cut off. She likes to watch the celebrity anti-gun violence video everyday. She says it's really inspiring to hear all those political experts explain exactly how it's our government's job to keep us all safe. She also loves learning how to think like a "really cool person". She checks the pressure in her tires everyday. Wouldn't wanna burn superfluous fuel and singlehandedly cause global warming. She made sure NOT to do anything CRAZY like go to an open air war memorial or try and see a national park. That would just be WRONG. She drove by our local university and made sure that the protesters there knew they had her full support. 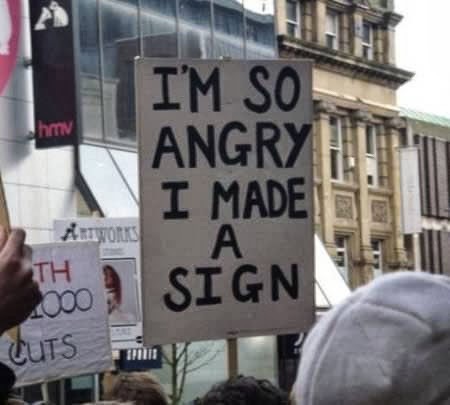 I'm not sure she knew what they were protesting, exactly. But she made a few signs so they knew she wasn't one of those RACISTS. She swung past our DMV to watch an informative video about texting. She wanted to make sure she was safe. Texting while skydiving is ok. Check. "But I *never* text and drive." That's right. That's when it's not safe. Now she's got it. While she was out, she figured she may as well stop by our local elementary school. It's important to keep children safe, and they don't know what's best unless we tell them. "Thankfully", she told me, "I brought my book of postage stamps with me." *She thumbed through them and compared to them to the children on the playground. * "No wait! Sweetie!! You are definitely gonna get hurt if you don't put on a helmet before you do that headstand! Wow. It's a good thing I got here in time." I have no idea how she keeps up the Obamaquired pace that she does! It takes hours and HOURS! Heck, I'm retired and don't have time for all that. I'll believe a lot of things, but not that there is a woman alive who checks the pressure in her tires once a year, much less once a day.